She was supposed to be a joke. Sell some comics, have a laugh, and then be forgotten. But she hung around. She became unbelievable. And her story is still happening, every time somebody reads about her or plays with her toys. A self-made hero from the so-called real world, Gwenpool possesses unrivaled knowledge of the comicbook universe. Thanks to the speed with which Minimates can be made of new characters, we've already discussed who Gwenpool is and how she came to be: in June 2015, Marvel published a bunch of Gwen Stacy-themed variant covers, including one on Deadpool's Secret Secret Wars #2. The design was popular, so Marvel decided to make her a real thing. Writer Christopher Hastings made Gwendolyn Poole a girl from our universe who somehow found her way into the 616; not just wanting to be an extra, she got herself a costume and set about using her fangirl knowledge and the lax consequences of a comicbook universe to make herself matter. The character was cute and funny and fun-loving, and so naturally her series has recently been cancelled. Thanks, comics! Gwen isn't a tall girl, so this toy mostly uses the teen body with a few extra pieces to set her apart. For instance, the armor strapped to her forearms isn't something that's been shared with any of the previous girls, and the same goes for everything below the knee: rather than wearing superhero boots, she seems to wear shinguards over white mid-calf socks and a pair of sneakers that have been dyed pink. Other than the bare legs, Gwenpool's costume is the same pattern as Deadpool's, swapping red for white and black for pink. Like Deadpool, she has silver snaps on her chest, but on the first figure I got, those paint apps were applied pretty far off-target, so instead of fitting into the notches on the design, one overlapped the border between colors and the other was nearly in her armpit. The figure comes with two heads, both wearing her mask with the little flap on the top. One shows her with a big, wide smile, while the other has a somewhat smaller smile and her tongue sticking out to the side. Because there's no more timely (and timeless) reference than Miley Cyrus. Honestly, we're surprised there wasn't more of an outcry about the tongue head when it was revealed at Toy Fair: that seems like exactly the sort of thing The Internet loves to get in a twist about. The shape of the jaw looks a lot more like her first appearance art (by Danilo Beyruth) than the later (better) Gurihiru art. 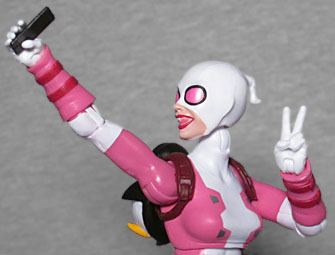 That tongue-out head is specifically intended to go along with a few of her other accessories: being a modern girl, Gwenpool is never without her phone, so this toy comes with a black plastic rectangle meant to represent said device; and since all the existing hands would have been too open to hold it, she comes with a new right hand specifically shaped for the phone. Add to that the new left hand flashing the peace sign, and the fact that the toy has all the usual ML articulation, and you'll see that she's making a silly face because she's taking a selfie! Those aren't her only new hands, either. In the package, she's got a pair with a fairly wide grip, which would normally seem strange, but she's posed in the tray to make the purpose clear: she's making a heart sign. Damn shallow millennials! Her only weapons are the same kind of swords so many Deadpools have, but instead of having scabbards for them, she tucks them into her super cute penguin backpack. It's so adorable and chubby! She wears a single brown belt around her waist, and has a second utility belt down by her hips - that's a new mold, with a G belt buckle and a slot specifically designed to holster her phone. Love it! Of course, the toy also includes a pair of hands shaped to hold the hilts of the swords. Still, it's a shame she couldn't come with an unmasked head and a stuffed MODOK toy, too. 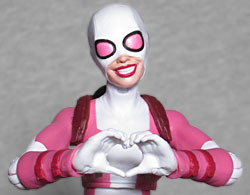 You might expect Gwenpool to have been part of the Deadpool Marvel Legends line, but nope, she comes as part of Spider-Man Series 6. As such, she gets part of the Lizard Build-A-Figure: the tail. She even gets her own packaging graphics, done in pink instead of Spider-Man red. As a character who began life as nothing more than a variant cover, Gwenpool is fairly unique. It's really just her and Iron Patriot (as long as you accept that Iron Patriot is nothing more than an riff on Iron Man's Captain America armor). Her comic is worth reading, and even if it was beaten to the punch by Marvel Minimates, it's cool that she's got a figure already. She and Ghost Spider can band together to form the League of Extraordinary Gwen-tlemen.